It’s 3:30am on Friday morning and I’m due to leave for Reading (and then Leeds) festival in less than 6 hours. Crikey. Week 34 – and our story begins on October 9th 1991 when my dad took me along to ‘The Abbey’ (a football stadium) to see Manchester United play Cambridge in the 2nd round of the Rumbelows League Cup. The game finished 1-1 with United going through on aggregate and after all the singing and shouting we drove home (via Macdonalds) with smiles on our faces. I didn’t know it at the time but playing up front for Cambridge was a chap called Dion Dublin and less than a year later he signed for Manchester United. Shortly afterwards he scored a last minute winner against Southampton and became my favourite player for at least a week (kids can be so fickle)! Fast forward to June 2012 and we’re in the thick of #onesongaweek. 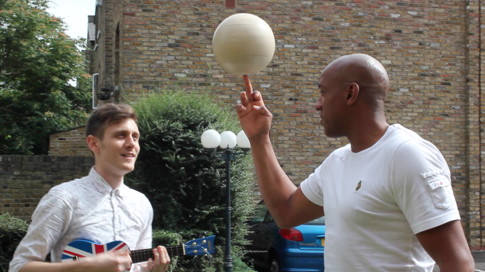 England are still in the Euros and week 21‘s football song has just been featured on the same BBC 5live show as Chris Kamara – who’s interview happened to mention that Dion Dublin was now a keen drummer and saxophonist. Interesting. The power of google led me to Dion’s website and I spent a while reading all about a new percussion instrument he’d invented called The Dube (it’s kind of like a cajon, but better!) before using the ‘website contact’ form to chance an approach about working together. Long story short a nice lady called Clare was interested enough to pass my message across and the rest, as they say, is history. 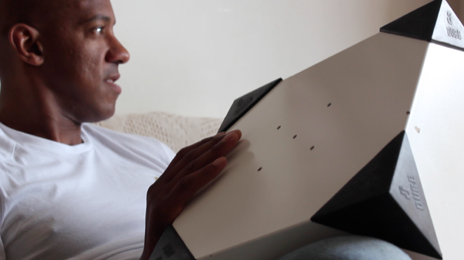 Dion first came to visit #onesongaweek HQ in July and during a banterful few hours we established that he was great with rhythms but not so hot with melodies – he’d never even sung, let alone written a song before. Therefore the task was simple – to write a song together and get him singing (as well as tapping) on it. So here it is. 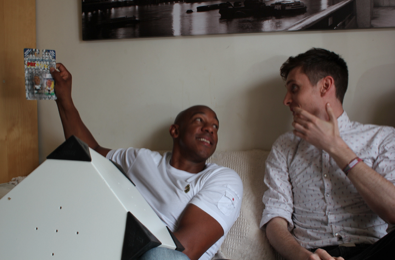 Week 34 – written by myself and Dion Dublin less than 48 hours ago and featuring the big man himself on backing vocals! Dion came over on Wednesday morning and after a leisurely start we eventually stumbled upon a riff/first verse idea. The lyrics kept changing but the chords and melody were solid which meant we could plod through to the chorus and get a vibe for how it all felt. After an hour or so of pacing around my lounge to no avail we relocated to the car-park and sat in the sun with a Ukelele. Like many other onesongaweek tracks – that’s where the chorus was finally born. God bless my car park. 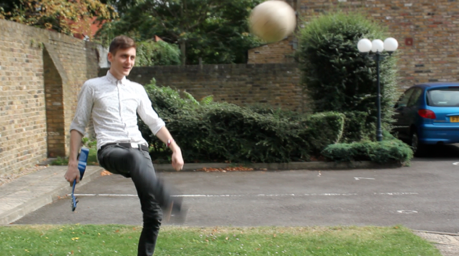 We celebrated by kicking a (flat) football around for a bit and I recited stories of former glory (like the time I scored 63 goals in one season of cub football and the time I scored a first-time lob from 45 yards in an U17’s cup final) only to have them (and my claims to be ‘a bit like Teddy Sheringham’) laughed off. Ouch!! We then spent the afternoon recording guitars, percussion and Dions (first ever!) vocals before he toddled off to meet Dave Vitty and I sat down with me, myself, I and my laptop to piece it all together. On the whole this week has been a lot of fun and I wanted that to come across in the recording. I love the drums in the chorus (entirely Dion’s idea! ), the guitar riff in the intro and middle section… and I couldn’t resist putting a splash of accordion and even some stylophone in there towards the end. It’s now 4:30am and I have to be up in about 4 hours but I’m not really in the mood for sleeping. It’s been a cracking week, I made Dion Dublin sing for the first time ever and in just over 12 hours I’ll be onstage at Reading festival. None of this would have happened if it wasn’t for this ridiculous #onesongaweek idea. God bless my-car park. Nothing ever surprises me with you Frank – EVEN having a first class footballer collaborating with you on OSAW! Now will you PLEASE get your arse over to Australia so they can experience some decent musical talent?! Dion’s a lovely guy, he lives next door to my parents. Love the dube! love the song as per.